We needed more storage space in our laundry area and got it with this beautiful EVOKE Alder pantry in Oxford Blue finish with the Chesapeake Narrow door style and a classic raised drawer. 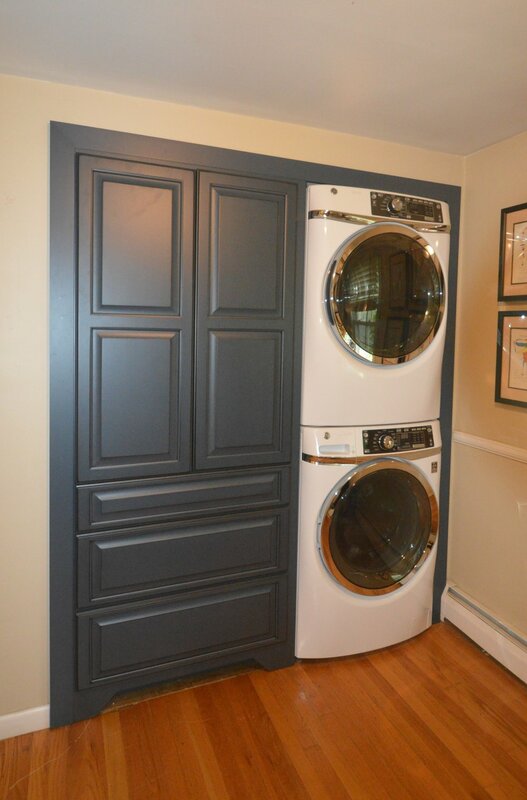 Check out this awesome one-day laundry redo! Want to see it in person? Make an appointment to visit the Open Door Cabinetry & Design Showroom in Doylestown, PA! Doylestown, PA-based Open Door Building Solutions, soon to be Open Door Cabinetry & Design, offers stock to fully-custom cabinetry for all residential & commercial uses from these top industry manufacturers: Cabico Elmwood, Unique & Essence Cabinetry; Fabuwood Cabinetry; Canyon Creek & EVOKE. We also feature Trex Outdoor Kitchens & NatureKast Weatherproof Cabinetry; Grothouse wood countertops; The Galley Workstation; plus an array of cabinetry accessories, decorative hardware & organization products. Our award-winning personalized service means that our commitment to your satisfaction is among the highest in our industry. Call 267-228-5494 or e-mail us soon to discuss your project.